Pastel tones and plenty of plants fill this hotel restaurant and bar in Vancouver, which local design studio Ste Marie modelled on a conservatory. 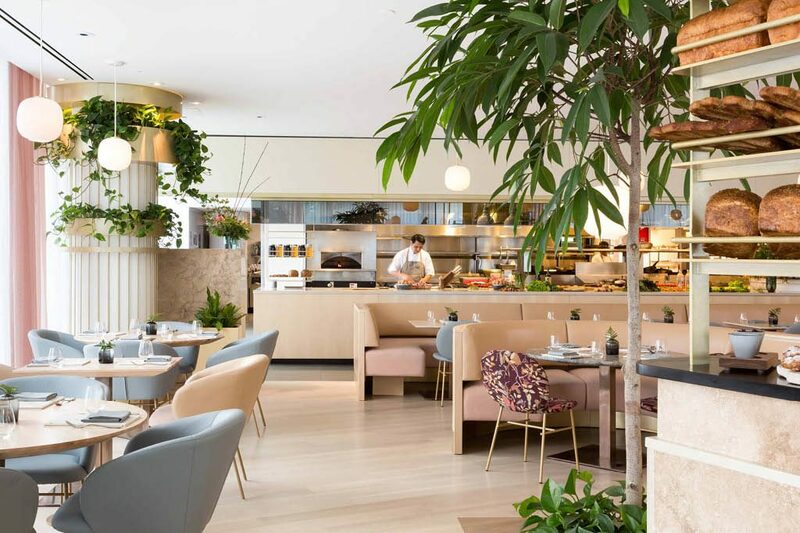 The Botanist is located in the Fairmont Pacific Rim hotel in the Downtown area of the city, and serves breakfast, lunch, dinner and drinks to guests and the public. It was designed by Ste Marie as four distinct areas to create a variety of dining experiences. “We have divided the space into quarters – with each area having a bit of its own personality,” said studio founder Craig Stanghetta, who also designed and owns the Savio Volpe restaurant in Mount Pleasant. The Botanist’s zones include a champagne lounge adjacent to the hotel lobby, where pink , gold drinks carts were chosen to create “a kind of ‘pop’ sensibility while still leaning into the glamor inherent in a room focused on that regal French fluid”. In contrast, the cocktail bar is decorated with dark colours like deep green for carpets and curtains, and greys for other surfaces including the terrazzo service counter. A small terrace forms an indoor garden that brims with flora, with planters holding species of various sizes along the sides and a green ceiling panel criss-crossed by fairy lights. The main dining has a light-toned palette, with bench seating upholstered in pale pink and beige, and freestanding chairs coloured pastel blue. Some seats have a bold floral pattern, matching the designs on the terrace and standing out against the light wood flooring. Soft pink is also used for translucent drapes that diffuse light through the building’s fully glazed external walls. More plants are scattered frequently through the space, surrounding columns and standing beside storage areas. “Throughout the entirety of the space, the plant life acts as a gentle counterpoint to the substantial and geological character of the materials,” said the studio. The Fairmont Pacific Rim hosted a retrospective exhibition of work by Japanese architect Kengo Kuma last year, for which he also created a teahouse for a terrace on Shaw Tower next door.